Long queues were witnessed around petrol stations yesterday as shortage of the commodity occasioned by a transporters' strike hit urban centres across the country. The VAT increased a litre of super petrol to an average of Sh128.70 per litre, with the Treasury taking Sh55.16 of the amount. 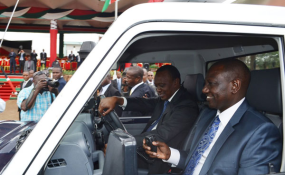 In Parliament, Mr Rotich and National Assembly Speaker Justin Muturi failed to agree on the way out of the tax stalemate with the clock ticking on the presidential assent window of 14 days. A second closed-door meeting held at Parliament Buildings yesterday between Mr Rotich, Mr Muturi, Leader of Majority Aden Duale, Budget and Appropriations Committee chairman Kimani Ichung'wa, Finance and National Planning chairman Joseph Limo, Attorney-General Paul Kihara and the Clerk of the National Assembly ended without any breakthrough on the fate of the amendment to the Finance Bill 2018 that postponed implementation of the VAT on petroleum products to September 2020. "We have been meeting with the National Treasury and the Attorney-General's office as a House leadership to address issues raised following the implementation of the law. "We will be able to address whatever issues of concern to Kenyans and work is going on. I want to assure Kenyans that we will get a solution very very soon," Mr Muturi said after the meeting. Mr Rotich said the Treasury and Parliament had started consultations and that yesterday's meeting was the first of a series of meetings aimed at dealing with the issues that had arisen after the law came into force. Sources at the meeting told the Business Daily that Mr Rotich sought more time to consult with the Executive while Parliament's leadership retreated to seek a solution on the way forward. The High Court petitioners, Messrs Titus Alila, Francis Ogada and Ms Jackline Otieno sued Mr Rotich and ERC saying the imposition of the fuel tax that has seen prices of all petroleum products shoot since last Saturday, had injured their constitutional rights. The additional fuel charges are contained in the Finance Act 2013 and are in line with Kenya's promise to the International Monetary Fund (IMF) six years ago to do away with tax exemptions as part of a wider plan to grow revenues, reduce budget deficits and ultimately slow down the debt pile-up that has in recent months become a source of national concern.